Converting Emails from .EML to .HTML Files. A .eml file is an individual email message that has been moved outside of an email client, such as Mozilla Thunderbird. EML files may contain pictures, file attachments, email metadata, and more. Its very common to receive email messages that are formatted either as Text (.TXT) or HTML files. Embedding HTML in emails lets the sender mark up the text. They can add formatting, titles, colors, images and logos to their email messages. In an earlier article, we described how to convert .eml to text files with EmlViewer Pro (also known as PstViewer Pro), the email https://www.emlviewer.net/2013/08/19/how-to-convert-multiple-eml-email-into-text-files/viewer software for Windows that lets you discover and convert email messages. If plain old text files are too boring for you, let us show you how to convert .eml email files directly into HTML documents. You could even post them to your web server, if you like, for the entire internet to see. Saving a .eml email file as html file will save the HTML code to a .html file. Instead of having all of the elements contained in a single .eml file, an email converted from .eml to .html will be broken apart, just like a regular web page. The individual elements will be stored as separate files that are linked from the resulting .html page. Any embedded elements, like pictures, will be stored in a folder. Converting .eml files to .html is useful if you want to preserve the email content, but also want easy access to embedded images or file attachments. Although we are describing how to convert .eml to .html, this same process can be used with EmlViewer Pro to create html files from emails stored in .msg, .pst, .ost and .mht files. You can convert one email to html, or bulk convert thousands of emails to .html. If you would like to follow along with the step by step instructions, download a 15 day free trial of EmlViewer Pro software (also known as PstViewer Pro)for Microsoft Windows by Encryptomatic LLC. EmlViewer Pro is also known as PstViewer Pro. At one time EmlViewer Pro and PstViewer Pro were separate products, but they have recently been combined into a single more powerful product able to process many different email formats. Step 1 Start EmlViewer Pro. Using the folder explorer on the left side of the screen, select the folder containing your .Eml Files. The emails will be viewable in the EmlViewer Pro mail list. Step 2 Select the Eml files you want to convert to HTML. Selected files will appear highlighted in the mail list. Step 4 Click the “Export” button to begin the export process. The Eml files will now be converted into Html. Lets take a look at the folder and see how the files are organized. 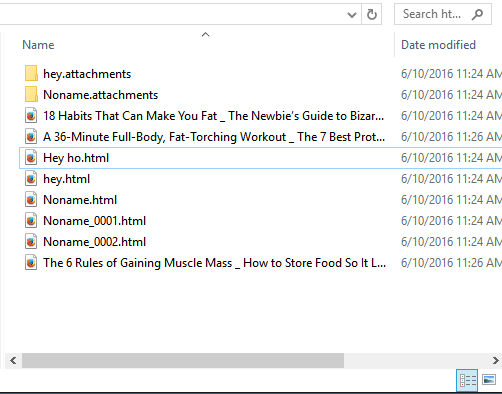 Notice that the folder contains .html files that use the email Subject line as the file name. The image elements for emails that contain them will be placed in a sub folder, which will share the same name as the html file. Folder organization keeps the email elements (images and file attachments) from being mingled with other emails. 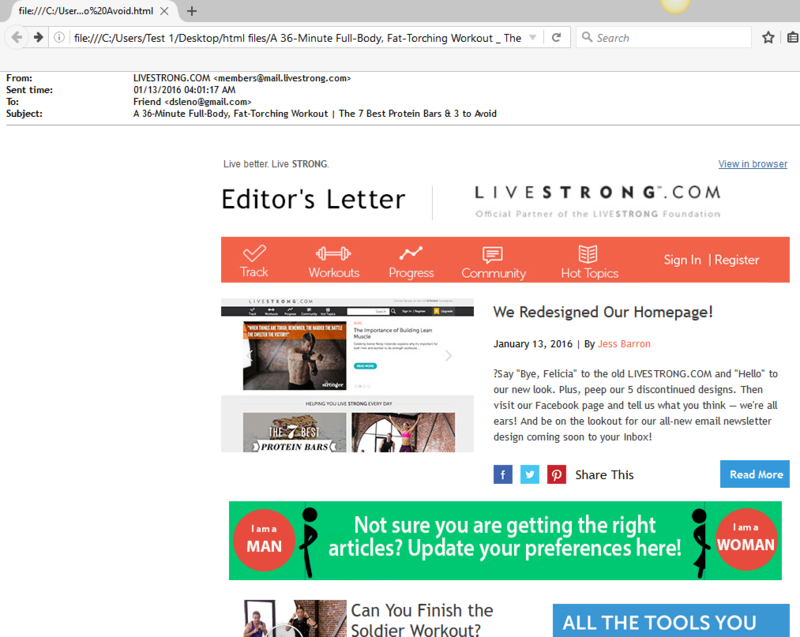 An Email that has been converted to a HTML file, displayed in Google Chrome web browser. If you have any questions about EmlViewer Pro, post them below, or use the online chat service here to talk to a support technician.